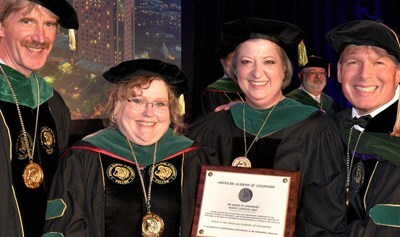 Kendi L. Hensel, DO, PhD, FAAO, of Fort Worth, Texas, was chosen to be the president-elect of the American Academy of Osteopathy (AAO) on March 22 during the AAO’s annual Convocation in Dallas. After spending a year as president-elect, Dr. Hensel will become the 2019-20 president of the AAO, the nation’s largest medical society devoted to fostering neuromusculoskeletal medicine and osteopathic manipulative medicine and (NMM/OMM). Dr. Hensel is an associate professor in the Department of Osteopathic Manipulative Medicine at the University of North Texas Health Science Center’s Texas College of Osteopathic Medicine. She recently completed a National Institutes of Health–funded study on OMM in pregnancy. In 2009, Dr. Hensel received her PhD in OMM Clinical Research and Education from the University of North Texas Health Science Center, and in 2018, she became a Fellow of the American Academy of Osteopathy (FAAO), an earned degree signifying exemplary scholarship in osteopathic medicine. Dr. Hensel has served on the AAO’s Board of Trustees and the American Osteopathic Association’s Bureau of Osteopathic Clinical Education and Research, and she is an associate editor for The Journal of the American Osteopathic Association. She chairs the American Association of Colleges of Osteopathic Medicine’s Education Council on Osteopathic Principles, and she is a member of the Osteopathic Cranial Academy and the American College of Osteopathic Family Physicians. Dr. Hensel said, “I’m honored to have been elected by my colleagues that share my love of osteopathic medicine, and I’m looking forward to serving the profession.